You cannot put a dollar figure on the value of experience. Hard work and integrity are Spectrum hallmarks. We are the most committed; you will not find another company like Spectrum, nor will you find other people like our people. We will outwork our competitors, and our loyalty is second to none. Owning all of our own equipment, leaving nothing to chance, we offer an extreme competitive advantage over all others. Instilling a strong sense of urgency throughout our company allows Spectrum to be the most prepared, the most self-sufficient, and the most successful. We challenge you to put Spectrum's experience to the test TODAY! Partnering with Spectrum is a game changer; together let's change how the game is not only played but how it's won! Since our first PGA TOUR hospitality experience in 1984, we have grown to serve major golf tournaments in North America. 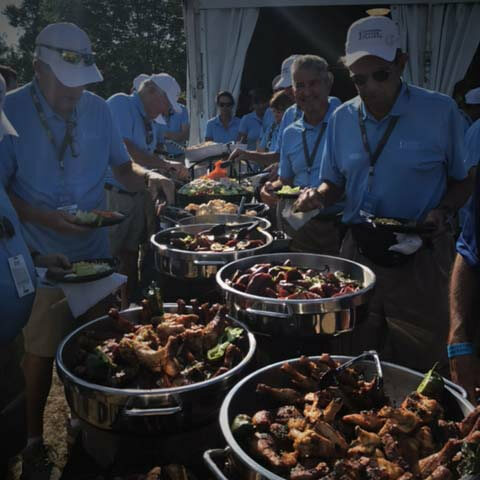 Experience in golf hospitality is the single most important element of consideration when selecting a firm to handle your golf tournament catering and concessions. Because of Spectrum's unsurpassed experience, we are the leading hospitality provider for the PGA TOUR in the United States and Canada. We understand that your number one goal is to produce a first-class golf tournament experience for your sponsors, corporate hospitality clients and guests. Spectrum's number one goal is to ensure your continued success. We are committed to consistently delivering the highest quality product, an unmatched level of presentation and service, and a can-do attitude. Utilizing our meticulous pre-event plan for logistics, production, staff and all hospitality requirements, Spectrum stays ahead of demand. Our attention to detail ensures that your sponsors' and their guests' expectations are exceeded and their renewal ensured. Off the court. Out of the pool. We are the reigning pros off the field, your concessionaire for any sporting event. We do it without helmets, racquets, or a set of irons. Game face on! We’ve done it all – the NCAA Final Four March Madness Festivals, US Davis Cup Tennis Tournament, United States National Diving Championships, Montreal Impact Stade Saputo Stadium, PGA TOUR, and everything imaginable in between. Spectrum Catering, Concessions, and Events was there with our special brand of hospitality production. Our PGA TOUR events are a great reference to our national exposure, but our expertise does not stop at incredible golf concessions! At Super Bowl XXXVIII Spectrum generated over one million dollars in gross concession revenue at the Main Event. Spectrum turned right around and repeated this success at Super Bowl LI in Houston. There simply is no substitute for experience. Pick a sporting event and Spectrum will provide a concession experience to complement it. Contracting with Spectrum Concessions eliminates risk and the “what if” factor, replacing it with quality, professionalism, and enhanced revenue streams. As concessionaire to the largest, most prestigious outdoor music events in the country, Spectrum has constantly delivered the first-rate service that has produced the greatest per caps in the industry. Hard work and integrity result in greater revenues for promoters; from Forecastle to Bonnaroo, KAABOO, Governor’s Ball, and Life is Beautiful, just to name a few. Spectrum sets the benchmark in generating revenue for concert and festival catering and concessions. Why? We understand that the window of opportunity is brief. So, we stay open longer, tailor menus to the specific crowd, and offer what they want in premium sizes. Our operation is uncompromisingly designed to maximize sales, and our tight financial controls are legendary. We are simply the best in the concert concession industry. The bottom line is that Spectrum delivers the highest per caps and generates the highest revenues of any concert concession company bar none. AEG, Live Nation, Super Fly, Bowery Presents, AC Entertainment, C3, and many other national and independent promoters demand Spectrum "Show them the money!" If you want to maximize your revenue stream and your investment, you need Spectrum — we’ll show YOU the money! Spectrum’s Festival Division works closely with event promoters, producers, and non-profit organizations to provide all aspects of festival event management. Spectrum provides anything that it takes to produce a successful outdoor festival; from working closely with City and Municipal Governments, to the precise site layout design in AutoCAD LT, to financial and budgeting services, we have you covered! Spectrum provides security team management, curated culinary and beverage concessions, as well as community first involvement. All site operation services are managed or provided in house - we like to say that we are the “first to come, last to leave.” Join our prestigious list of community oriented events, and experience the Spectrum difference! Spectrum is the industry leader in backstage catering, delivering celebrity service and satisfying personal passions since 1992 to the top names in the music industry. What do the largest music festivals, the most demanding touring artists, and venues with the highest standards all have in common? They all depend on Spectrum to exceed the expectations of their artists and crew. Every time! Our dedicated touring management team has earned its reputation as the preeminent caterer at the top venues in North America; Bonnaroo, Burning Man, Governor’s Ball, and March Madness Music Festival, just to name a few. Whether it’s touring with The Eagles or tour rehearsals for Madonna, Jimmy Buffett or Aerosmith, we have proven that Spectrum can make any venue feel like home. Spectrum also serves all aspects of touring entertainment and is the exclusive tour caterer to Cirque du Soleil’s North American Touring Shows. Committed and flexible, with unparalleled attention to detail, Spectrum’s performance in the kitchen, dressing room and dining room consistently gets a standing ovation backstage. Spectrum is the leading venue hospitality management group for many permanent Entertainment Venues and Sports Stadiums. Spectrum is a proud partner of industry leaders AEG, Live Nation, Broadway Across America and many more! Delivering innovative, quality services at a valued price. For a hospitality experience that complements your venue, call on Spectrum Catering, Concessions, and Events. Take a sneak peek at Spectrum’s Entertainment Venue Profile.